If your New Year’s resolutions include losing weight, adding muscle and looking and feeling fitter, happier and healthier then you don’t need to spend hours pounding the pavements or even give up your favourite foods. Joe Warner, the deputy editor of Men’s Fitness, the UK’s best-selling fitness lifestyle magazine, went from flabby, out-of-shape man to a cover model star – complete with rock-hard six-pack – in just 12 weeks, and reveals the secrets to how you can build a brand new physique with only four hours of exercise per week. ‘I spent most of my 20s doing a lot of running but no matter for how far or how long I ran I would always have a bit of a belly and never any muscles on my chest, shoulders or arms,’ he says. ‘After turning 30 I decided to see whether I could get into the best shape I have ever been in. ‘I deal with a lot of fitness models for my job but always thought I would never be able to get a physique like theirs. ‘I believed I just didn’t have the right genetics or enough time to make it happen. But it turns out that there is no legitimate reason for not making huge changes to the way you look without a t-shirt on. ‘When Joe came to me he had a ‘skinny fat’ physique, which is when you have very little muscle mass on your torso but a large amount of fat stored around the stomach. 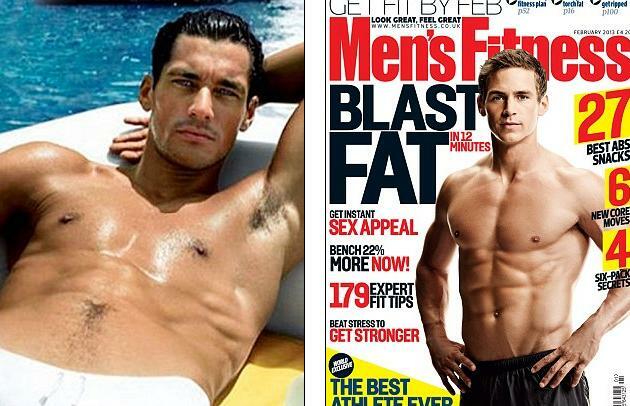 ‘It’s a body shape I’m seeing increasingly among UK men and one that can lead to a lot of long-term health issues, especially diabetes. 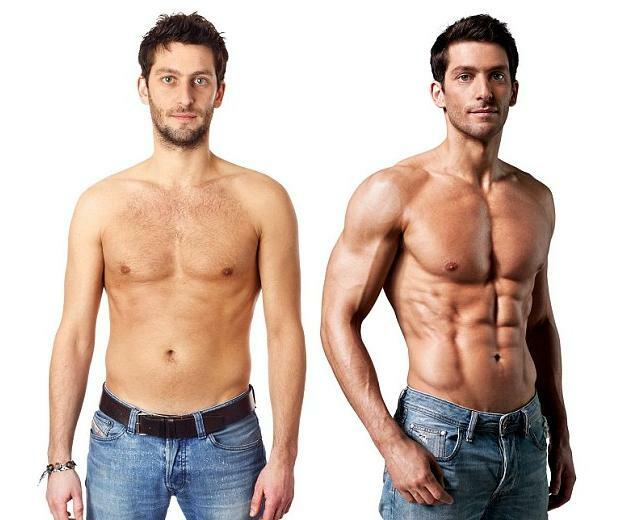 Nick’s training programme revolved around just one hour-long gym session four times per week, and in 12 weeks Joe shed 8kg of fat – the equivalent to 16 large packets of butter – while building 10kg of lean muscle mass to completely transform his body into one worthy of gracing the cover of Men’s Fitness magazine. Joe’s four sessions were carried out on Monday, Wednesday and Friday lunch times, and first thing Saturday morning, so it had minimal impact on his work or social life. ‘Instead of working through lunch with a sandwich at my desk I got out of the office, trained, worked off some steam them came back to my job more energised and focused,’ he says. ‘I found my productivity soared once I started training. Even if you have a very busy, very stressful job finding just four hours per week to train will not only have huge benefits to your physique, it will also help you combat stress levels and allow you to work more effectively and efficiently. ‘I started seeing major changes after the first week and after a fortnight by body-fat percentage had tumbled from nearly 17 per cent to 12.8 per cent, with nearly all of the fat falling off my stomach,’ says Joe. The key to getting rapid results is to work out intensively for a short amount of time, then give your body time to recover fully before training again,’ says Nick. ‘Training for too long in one go is counter-productive to getting a better body: it places too much stress on your body, which actually eats away at your muscles and encourages the storage of fat. Joe’s diet revolved around plenty of lean red meat and white meat, fish, fresh vegetables, eggs and slow-release carbs, such as sweet potatoes. ‘The diet I followed was simple but effective so I was never hungry,’ he says. ‘You do need to be organised so that you are never tempted by a quick sandwich and crisps at lunch, but I found that I was actually enjoying my food more on the diet than before, mainly because steak, vegetables and sweet potato mash is far more delicious than a pre-packed sarnie or ready meal. ‘I could even have a glass of red wine at the weekends, so never felt as though I was sacrificing anything,’ he adds. ‘At first it was hard to go out and not being able to drink or order anything I wanted off the menu. ‘But most restaurants will serve steak, chicken or fish and happily give you as many vegetables as you want. ‘Joe has proved that training hard and eating healthily is all you need to do to transform your body into one that can grace the cover of a magazine,’Nick adds.